I used China Glaze Something Sweet, and stamped it with Konad white and plate m57. 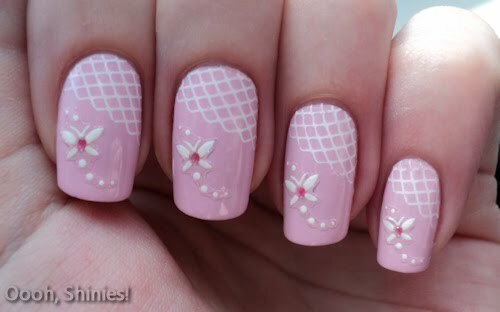 This is the first time I used that image, and I haven't been stamping for so long, so it was a bit hard. 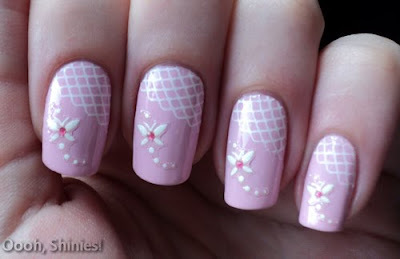 I find stamping straight with images that aren't full nail (or full nail but only used half, like now) pretty tricky. But I guess I just need to practice more, especially with my left hand, because my right hand turned out less good lol. The little stickers that I used I got from an Ebay seller that ran out of some stuff I ordered. She added them and some rhinestones as an apology, that was a nice suprise! You can see the lines of them on my pictures, but that's just the macro option having no mercy. I considered coloring in part of the stamping as well (in the color of the butterfly's belly), but I'll probably try that before I remove it. Something Sweet is one of my favorite polishes, I like the color a lot and it's nice to stamp on as well. It's incredibely warm here today, I feel like I'm melting!